Evil emperors! Beastly battles! Violent villains! Rowdy riots! They’re all in the ickiest annual around – now with noxious NEW nasty bits! Yes: the Horrible Histories annual is back yet again, all set to bust Boxing Day boredom. Filled with treacherous tyrants, brutal buccaneers, cruel kings and other murderous meanies, it’s full of foul folk you wouldn’t want to meet in a dark alley – but who are great to read about on a dark winter’s night. Sickening Stone Age funeral soup. Deadly Celtic druids. Bison-bashing hunters. Vile Victorian inventions. From the awesome Ancient World to the terrible 20th Century, there’s enough sickening stuff in here to make you howl with glee! i think horrible histories is the most funnieset way to learn about history. I have all the books and both the 2010 annual and the 2011 one! I love the tv program to! (Much better than the books aswell!) 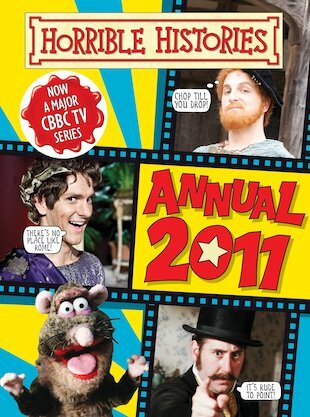 Although im 12 years of age i love horrible histories in every way and terry deary is a brilliant author and a historian (In a sort of way!) For my birthday im getting the new books and i cant wait! Hopefully they will bring out a series three of the television program!